Every time I bring up United, I hear comments about Legacy Continental and Legacy United. Crews, Frequent Flyers, and everyone else has an opinion of who is better. 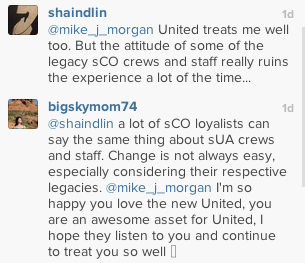 The conversation on the left came about on a picture I posted on instagram to celebrate the one year anniversary of the New United. "But the attitude of some of the legacy sCO crews and staff really ruins the experience a lot of the time..." This is a phrase I've heard all too often. Last night I flew from ORD to MCO on a United B737-800W. Without a doubt, it's a former Continental ship with an ex-con crew. We were delayed out of the gate due to a late incoming pilot team, and people were a little restless. But, just before push, the pilot came on and apologized for the delay. With that, we were on our way. Somewhere around 26,000 feet, the pilot (for the sake of not having his permission to use his name, we will just call him Rob) came on to tell us about the flight. This is when I knew things were different. "I want to thank you for joining us on this UNITED flight! You've got four great UNITED flight attendants in the back to help bring you the best UNITED service!" A United 767 Tail Stands Proud at ORD. Rob was not afraid to be proud of being part of the new United. And to be honest, the flight was amazing, and the service was beyond what even I expect from United. At the end of the flight I waited to meet Rob. I was invited into the cockpit (which, I must say, was AMAZING (yep, first time in a 737 cockpit)). I told Rob that what he did really meant something to me. I thanked him for embracing the new brand, and not being afraid to be a part of it. Of course, I then got his information and submitted him to the Outperform Program (which, to be blunt, United would be crazy if they don't recognize him for this). I shook Rob's hand and was on my way. As American and US face a merger, I would have to say that they could learn something from my pal Jeff Smisek. He understood that Culture was the most important thing, and he's been working hard at it. We've seen it before in the Traveling Scarves and Ties program, but this was the clearest it has ever been made me from ex-con crew that they were excited about the change. I hope that United seeks Rob out to thank him, and encourages him to spread his love of the new company with other team members. I hope that Jeff and the leadership of United realize what a little action this is, but how big of an impact he made to the people on that plane. The fact is, there is only one United now, and a year after the combination to a single passenger system, I believe it still is the greatest airline ever!